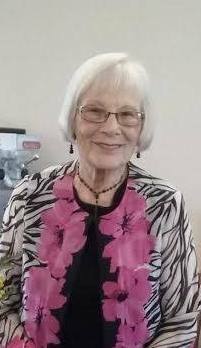 Bonnie Eileen (Smith) Wacker, age 91, of McCook, NE, passed away Friday, November 16, 2018 at Hillcrest Caring Center in McCook. Bonnie grew up during the Dirty Thirties or the Depression Years. The Flood of 1935 followed the dry years causing destruction of homes, farmland and many lives. A shortage of Polio and Typhoid Fever vaccines accompanied Bonnie’s junior high years and the outbreak of WW II aligned with Bonnie’s high school graduation in 1944, after which every boy in her class left for the war. Despite the tragic events of her childhood, Bonnie found happiness in the strength of her family and her friendships. Toys were scarce but imaginations were developed to the fullest. Mud pies, hopscotch, marbles, and playing jacks were a part of her favorite memories. “War ended and our boys came home, and one special one for me.” Bonnie married Robert Donald Wacker on June 2, 1946 at the Methodist Church in Trenton. The couple was blessed with three children Barbara Ann, Robert Scott and Mark Stephen. Seven grandchildren followed as did nineteen great grandchildren. Many dear friends, teachers and parents of her friends had left Bonnie with such great memories of the small town life. Bonnie was baptized at the Trenton Methodist Church and later joined St. Alban’s Episcopal Church in McCook where she was an active member for over fifty years. In her later years, Bonnie attended McCook Christian Church. Family life revolved around the church where lifelong friendships were made. Bonnie loved her family and was active in Bible studies at her church. She enjoyed playing golf and bridge. Being with her friends, who were also very special to her, was something Bonnie treasured. However, being a mother was her number one priority in life. She loved making her house a home. Bonnie gave her Lord and Savior all the credit for the blessed life she lived. Bonnie was preceded in death by her parents; siblings, Keith (Lucille) Smith, Norman (Freda) Smith and Shirley (Laurel) Hayward; and great granddaughter, Lucia Wacker. Those left to celebrate her life include husband, Robert Wacker of McCook; three children, Scott (Sue) Wacker and Mark (Monica) Wacker, all of McCook and Barbara Ann (Larry) Hoff of Central City, NE; seven grandchildren and eighteen great grandchildren; as well as numerous extended family members and many special friends.